The Dungeons & Dragons 5th Edition Dungeon Master's Guide is a odd book, much like the 1st Edition AD&D guide it is a scattered confluence of ideas, suggestions and game-able content. Unlike some past guides it seems more interested in offering play options and setting variety to Game Masters, rather then creating the one true setting and manner of playing D&D. This is perhaps the strongest aspect of the 5th edition brand - that makes motions in the direction of creativity and setting variation which some earlier editions refused to. Perhaps starting in the late 80's - early 90's as TSR released setting after setting, the idea embraced in the earliest editions of the game that each table of players and Dungeon Master should create their own world (I'd argue collaboratively), was abandoned and D&D products seemed to push an orthodoxy with settings defined and each setting deadened by reams of officious petty rules and mechanics. For example, the Spelljammer boxed set (a 1989 setting about fantasy space and space faring on magical sailing ships) spends little time offering up the sorts of strange and fantastical setting ideas it's core conceit promises, glossing over some great ideas in favor of complex rules about orbits and star types that seem more appropriate to a hard sci-fi game like Universe or Traveller. 5th Edition doesn't make this mistake, or at least it hasn't yet, and while I may critique its efforts at producing adventures for their devotion to the terminally bland Forgotten Realms setting and heroic fantasy, the Dungeon Masters Guide at least suggests Dungeon Masters design settings that vary greatly and offers some rules to aid in creating settings in 'mythic fantasy' (classical antiquity/mythology), 'epic fantasy' (even more high powered and magically focused), 'wuxia', 'dark fantasy' (Ravenloft effectively), 'mystery', 'intrigue' and 'swords and sorcery'. Sometimes rules are even offered up by the Dungeon Master's Guide to suggest how to better run these different sorts of campaigns. The last category of 5e settings, "swords and sorcery", is largely a description of how earlier editions of D&D played (or perhaps were intended to play) - at least in my experience. Informed by the novels of Vance and other 30's - 60's pulp writers, this fantasy is a bit grim, and darkly humorous with heroes that are only slightly more impressive then normal men (or less in the case of Cudgel the Clever), who largely seek their own advancement and survive mostly by luck and their wits. The world is dangerous and uncaring, and if these sorts of wandering heroes become involved in an epic quest it is only by their own decision, a curse or accident. The Little Brown Books or "White Box" are the first edition of Dungeons & Dragons - presenting a simple and somewhat muddled set of rules that almost compels a 'swords and sorcery' style setting and game (at least as the 5th edition Dungeon Master's Guide defines swords and sorcery) because the combat mechanics are high lethality, power levels flat and the exploration rules encourage caution and the accumulation of treasure rather then seeking combat. Mechanics that encourage players to recognize combat as a hindrance and often unnecessary risk are a core element to encourage players to behave like swords and sorcery heroes - scheming and using their wits rather then simply engaging in heroic combat with everything encountered. 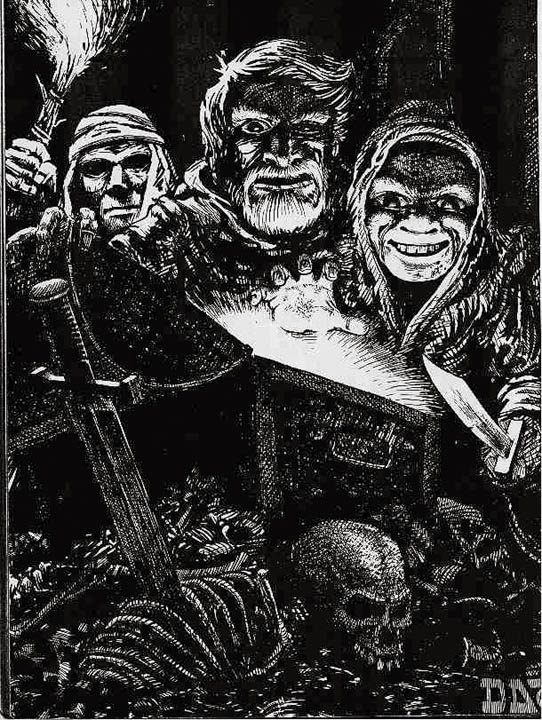 While early Dungeons and Dragons (and these days games seeking to emulate the feel or play-style of early D&D) uses multiple mechanics to encourage a swords and sorcery setting, and an exploration focused play-style, a chief among these mechanical changes is "Gold Equals Experience", where experience points are gained only from the recovery of treasure. This rule isn't strictly part of the even the Little Brown Books, which also provide 100XP per HD of enemy killed, multiplied by level/monster HD (so a 10th level character killing a 1HD monster gets 10XP and a 1st level character killing a 10HD monster 1,000), but the monster experience rules are complex and generally provide a small amount of XP, so in most games I've played using OD&D rules they're ignored completely and treasure becomes the means for level advancement. Gold for Experience is a powerful tool as it directly informs player motivation because redefines how characters are rewarded and what they are rewarded for. Demphasizes combat, as violence provides no mechanical advantage over negotiation or trickery. Demphasis allows encounters with creatures that are very dangerous to the party because there is no assumption that every encounter is a test of combat ability and no inherent mechanical benefit in destroying powerful foes. Puts exploration, setting interaction and information gathering at the center of the play experience (rather then combat) by treating challenge types equally. With players seeking wealth determining what challenges (combat, puzzle, social) will best provide it at the lowest risk the locus of play shifts from tactical combat. With combat dethroned from its position as 'the' player activity there is more room for player retreat and even less need to 'balance' encounters. Adjusts character goals by making them very clear and more open to player decisions. Has a neutral (or perhaps even negative) moral valiance that is very natural to contemporary players in that everyone understands making money or starving - but is open enough to allow for a range of moral play from dastardly evil to saintly good. Creates diegetic freedom, by simplifying goals and decoupling them from a specific narrative (XP for combat could do this as well - but since it favors one type of challenge over another and creates a narrative of relentless bloodshed it tends to require a heroic narrative to justify the sheer amount of murder involved). Players don't have to guess what the GM has structured as a story to move the game forward and will likely create their own goals based on interaction with the world and its factions. Simple and clear mechanical explanation for how level advancement works, giving players metrics on determining reward vs. risk. This allows GMs greater freedom in obstacle design as reward is not coupled with the completion of a specific set of acts. Gold for Experience can be managed in several ways, each of which slightly adjusts player incentives, but the key element is that treasure recovered from adventuring (not the sale value of magic items or income made from businesses or shakedowns of shopkeepers - only lost wealth brought back to civilization) provides the entire source of experience. An alternative way of managing this is that only treasure spent provides XP, which encourages player interaction with the world, but requires that a Dungeon Master have various ways for the characters to spend their wealth (this isn't hard to figure out and tends to work toward making characters more pro-social and players more involved in the world). Reasons to avoid Experience for other forms of wealth is to provide clarity about advancement mechanics, keep the characters firmly focused on adventure, and because they are likely to invest in schemes, property and businesses with their money once they've purchased equipment. Gold for Experience is a simple change, and the existing Experience (XP) charts for 5th edition will work fine, though they require significantly less XP then earlier editions. In 5th edition 2nd level comes with only 300 XP (or 300 GP worth of treasure) rather then the 1,800 - 3,500 (let's say 2,000 XP average) depending on class that first edition and the White Box use. Of course 5th edition also likes to suggest that 3rd level is the proper starting point for adventures, but amounts hardly matter, and the lower amount of wealth needed to gain levels doesn't mean that the characters will be poor - only that the first couple of levels of wealth will go to equipment. Obviously adjusting the experience needed to level and the amount of gold purchase typical equipment improvements (plate armor say) can change the speed of advancement and the how hardscrabble or gritty the setting feels. Mechanically the implementation is simple, but the default amount of treasure provided by published 5e products assumes that character wealth is a problem - this assumption isn't a serious limitation on using Gold Equals Experience rules, but one that requires some adjustments to work with. If we accept the idea that currently there are basically two forms of adventure design, location and scene based, Gold for Experience works best with location based adventure. While it would be possible to use it in a scene based games, the greater certainty about what treasure the characters will obtain and the ability of character wealth to potentially sidestep scenes and/or create player driven narrative (e.g. characters wish to build a fortress to defend against invasion rather then defeat invasion leader as originally pathed out) make it an additional awkward layer of potentially distracting mechanics rather then a core mechanic that encourages player involvement in the world. When a GM's work for each "adventure" is to design and place a location within the game world rather then prepare a narrative arc, placement of treasure isn't hard, and there's little impulse to force players to make specific decisions about exploration pace, location or difficulty level. Individual challenges are generally optional and players can take on locations and foes more difficult then they are 'leveled' for while retaining the possibility of retreat and shifting to another location they feel is less risky - risk vs. reward becomes the players' decision and not the GM's. In one of my favorite GP=XP games on the first session our party began to explore one of several entrances to the tent-pole megadungeon of the campaign. The first cavern we entered led quickly (room 2 or 3) to a huge chained dragon. Undoubtedly this foe could have killed us (luckily we were sneaky and it was sleeping), but if we had somehow defeated it the rewards would likely have been enormous. Our party, begin more cautious then greedy, retreated and never returned to face that dragon or steal its wealth - but it was still there, a challenge ready to be resolved. This is all it takes to build XP=GP adventure locations, placing wealth in an amount that will properly reward characters based on the difficulty or diagetic purpose of the location. It can be done in a very simple manner - each monster holds within its lair (or on its 'person') GP equal to its XP value. This of course is boring and quickly becomes identical the giving XP for killing enemies. Rather it's best to look at a location and decide based on both its importance to the setting/theme and on its difficulty how much treasure it should contain when compared to the speed of player advancement one wants to have in one's game. For example, when building a first level adventure for 5E there's a mechanical conceit in 5th Edition that characters should quickly reach 3rd level - first level is almost the equivalent of 0th level in games like 1e or Dungeon Crawl Classics - a condition that one brush with the mythic underworld and adventuring life should remedy. Thus one session of play (say a 5 - 10 room location) should provide enough treasure to get from 1st to 2nd level for the average party size (respecting 5e's mechanical complexity and robust PCs, let's call this 4 PCs) - that is 300 GP per adventurer. With this in mind that introductory adventure location should hold at least 1200 GP (300 GP/XP - worth of treasure for each adventurer). One might want to offer a little room for either players missing some treasure, or as a reward for excellent play and include (perhaps concealed or guarded by deadly traps) another 300 - 600 GP worth of treasure, but generally it's not hard to figure out how much treasure to include to create incentives and set the pace of leveling. Of course treasure placement can vary considerably, a location where all the reward is found in the final room is both challenging and often makes situational sense (a tomb full of traps or the treasure of a bandit leader) and offers the additional excitement/challenge for the players of figuring out where the treasure is and how to get to it while avoiding the greatest amount of encounters and risks. Alternatively a treasure might be easy to find, but bulky and hard to return to civilization (marble statuary, trade goods, a lost wagon full of iron ingots), the adventure becoming one of defending the wealth from thieves and dragging it back to where it can be sold rather then discovery. Another options is to have certain tasks or adventures where the reward is offered by a third party (the most common being bounties on dangerous creatures), and the "treasure" is obtained when the party returns to civilization rather then from the adventure location. This treasure ans bounty works well with the a sturdy faction system and the concept of social advancement found in many swords & sorcery literary works (Conan isn't usually trying to plunder to get rich, but seekign approval of a benefactor or fleeing the wreck of a social disaster). While treasure placement is something that should be intuitive, and works best if it's organic - that is the treasure makes sense to the setting, the more mechanical approach can be helpful especially for higher level adventures because sometimes it's harder to contemplate the amount of wealth required. Remember that while the gold necessary to level at the low levels is fairly small (Just 300 GP/XP to get to level 2 in 5th edition!) it quickly ramps up. At 5th level it will take 7,500 GP and at 10th level 19,000 to level. These amounts are smaller then in older editions and don't vary by class, so it's fairly easy to determine how much treasure should be in an adventure, but they are still considerable, to the point where a 10th level character would be pretty uninterested in a few hundred GP from the stance of mechanical advancement alone. Lets say we have a 3rd level party, and they are exploring a dungeon that should take three sessions (roughly 30 rooms - about 1/2 of them empty) and is designed for 4-5 characters. For the total dungeon that's 1,800 GP per adventurer (3-4th level) times 4.5 = 8,100 GP/XP split up in the 30 rooms. This can be split into parcels (never describe them as such though - please, use your imagination on treasure description) of 100 - 1,000 GP - hidden, laying out in the open deeper in the location, guarded by enemies, hidden, or protected by puzzles and traps. Players of course will miss some of the treasure, or decide the at conflict required to obtain some is too dangerous - and this is as it should be, the reason for placing extra treasure in the location beyond that required for expected leveling. The main difficulty in placing treasure to use for Gold Equals Experience is that treasure takes on a greater significance and players will be looking for items of value: attractive marble statuary will get smashed and parts sold, high quality furniture becomes loot, libraries are valuable and characters will even start to chisel artful frescoes or mosaics off the walls. Don't be phased, just assign values to these items and remember to make the players account for encumbrance - a couch may be worth a hundred GP, but navigating it out of the dungeon, past the spiked pit trap and down the mountainside can be risky both to its upholstery and the people carrying it. Likewise start considering what might decorate or fill out an adventure location that has value beyond coins. 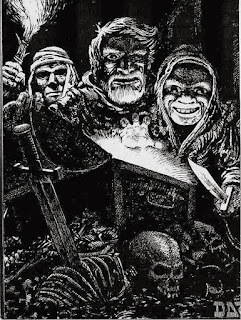 Too often modern adventure design simply notes treasure as something like "a parcel of treasure worth 200 GP or (popular in Curse of Strahd) "3 pieces of Cheap Jewelry each worth 15 GP". These treasure descriptions are boring and rob a great deal of potential wonder from the game, much as if you described every monster as "A monster with 42 HP approaches". Treasure should be evocative and interesting, and it's easy enough with small bit of description - a "copper brooch of a severed wolf's head" (potentially a symbol later found on some bandit group) or "a grey wool cloak lined with water stained pink silk" rather then "cheap jewelry". A GM should think about treasure and what might have value beyond gold and gems - pelts, steel ingots, art, cloth, liquor, arms and armor - in GP for XP game the GM will need to consider everything and its potential value, because the players certainly will. Some GMs may fear that GP for XP will rapidly increase the amount of wealth available to player characters and that this will somehow dramatically unbalance the game. This might be true in a campaign where the GM allow the purchase of magic items, spells and healing without limit or thought, but otherwise wealth won't have too much of an effect on character power. While second or third level fighters, having 1,000 GP may be able to buy better armor (though not plate armor at the Player's Handbook price of 1,500GP), and the party is unlikely to suffer for a lack of supplies, these don't seem deeply troubling. It seems to have become increasingly common in contemporary campaigns for magical items of all sorts to be available for purchase - part of this may be the influence of video games, where the magic shoppe is a standard trope, especially in Japanese style RPGs, and part of it may be a hold over from the focus on "character builds" and options, which required specific magical items, picked from a clearly defined list to maximize or best use a certain builds. None of this is necessary, or even desirable - and if purchasing magical items is something one wants in a game - it's easy to adjust the prices as the wealth a certain level of character will possesses is equal to his XP, meaning the GM can set the price of desirable/necessary magical items at a value which makes an appropriate dent in that wealth. Again if one allows players to buy healing potions for 50 GP and magic weapons for 500, then the wealth associated with using GP=XP might allow players to stock up, especially for a game that dispenses with encumbrance, but this should be both manageable and avoidable. Certainly the encumbrance system in 5th edition is poorly thought out, but there are plenty of ways to include encumbrance in one's games - the easiest, and one that elevates equipment selection and resource management to great importance is to rule that Strength equals equipment slots available. That is for each point of Strength a PC can carry a single piece of useful equipment (with some provision for items, such as up to 1,000 pieces of gold or jewelry that don't count towards encumbrance). While this is a gamified mechanic - with a potion or lantern becoming equally encumbering as an axe or plate armor - it has the advantage of being both simple and making it very hard for characters to load up on incidentals and magical geegaws. With some thought to what's available for purchase and carry (thoughts that are worthwhile even without changing the Experience Point system) is helpful, GP=XP does change the setting in several subtle ways. Now even if characters won't have quite the amount of gold in a 5th Edition Gold equals Experience game (2nd level required 2,000 XP at least in 1st edition) they will soon find themselves with considerable gold. This is a good thing and there are plenty of ways to use character wealth to enhance your game and encourage player interaction with the setting. It's a simple fact of human nature that players who have invested in businesses, monuments and interactions within a setting location will feel a desire to preserve it. The GM doesn't need to rely on a vague sense that the characters are heroes to get them to protect towns anymore - they are protecting their own homes or other things and people they've invested hard won treasure in. Obviously it's somewhat important to give players something for their characters to do with their treasure beyond buying heavier armor or carefully weighed adventuring supplies. Traditionally hoarded gold has presented a sort of victory condition in D&D - at 10th level or higher (traditionally called name level) the character could build a fortress and start attracting followers. Building castles, wizard towers and monasteries is expensive - very, very expensive according to the AD&D Dungeon Master's Guide. There's nothing to stop a current game from sharing this sort of 'endgame' and indeed the option to build fortresses is dealt with in the 5th edition Dungeon Master's Guide, along with most of the other ideas below and even a few additions. 5th Edition doesn't go into much depth though, and it's because these ideas of downtime activity are largely cosmetic, and aren't designed for a game with a strong material focus, where treasure is an important mechanical element. Regardless of mechanics, many players find something very exciting in investing in the game world, so it's important to model this in a way that's conducive to the other game mechanics. That is to say, to keep the players adventuring as a group rather then trying to run individual business empires or domains (unless that's the game one wants) the world should naturally siphon money from the characters. There are lots of ways to do this. You'll note that gold looted from peaceable peasants, noble lords and other ostensible 'good people' or 'bastions of civilization' counts as treasure, but this doesn't worry me too much as I will detail below in a Note on Murderhobos. Now encouraging players to spend their wealth is another subtle art of the Game master - well really there need not be anything subtle about it, and in my experience using these sorts of cash sinks during play it's best to keep them gamified - a menu of options with predefined consequence and reward for players to pick prior to or quickly at the beginning of each adventure session and then to resolve mechanically with a simple roll or paragraph of results from the GM. Of course, how you enact any of these strategies will depend on the specific setting and the nature of your game. Carousing and Upkeep:Since the October 1977 issue of Dragon Magazine the idea of adventurers returning to civilization and spending all of their money on debauch and vice (though even in 1977 other alternatives for less sybaritic characters are included - the dwarf hoard one is very good). The idea of carousing still works. In its most basic form characters spend gold (based on level, based on town size, based on risk - you decide what flavor works best) and gain additional Experience from whatever worldly shenanigans they get up. Sometimes it's good to balance this with a save (i.e. save vs. poison or don't gain any additional XP) or by adding complications. Carousing leads to humorous, mildly harmful or mildly beneficial events, usually pulled from a carousing table and often things like accidentally getting married or starting the next adventure with a huge and penalizing hangover. The 5th edition DMG has a short and rather dull version of a carousing table - but larger and more interesting tables are easy to create and can really provide setting flavor, or even event specific to a town or region. Likewise (as suggested back in 1977) carousing can be tailored to class type and more then one type offered. Carousing, or even an entirely separate mechanic, can also be used to generate hooks and rumors in exchange for treasure spent. One option is to simply give rumors as a side effect of carousing, as the players picked up gossip while they were on the town, another would be to charge specific amounts for say buying drinks around town or paying an information broker. However carousing is used it should be optional, and as an optional mechanic offer a benefit where the player can weigh risk vs. reward (the reward of extra XP vs. the risk of a complication usually). Because its a gamified mechanic based on a die roll rather then any narrative exchange between GM and player it's best to have the stakes very clear so bad outcomes don't feel cheap or forced. I let players roll on my carousing tables on their own - looking at the table, knowing what its options are. This provides little risk of meta-gaming if the tables are well designed and thematic, because the players seem to enjoy gambling on something with clear rules. During my last long campaign I had a three part table that allowed the character to spend up to LVL x 100 GP for an equal amount of XP if made a Save vs. Poison. Succeed or fail the player rolled on a complications table after picking which table: Lust, Debauchery or Violence they wanted to use. One of my more meta-game fond players examined the tables and determined the violence one was the least potentially risky, but this didn't stop players from using the other two based on their conceptions of their characters. Upkeep, as opposed to carousing is a forced expenditure, and while it's also mentioned in the 5th Edition Player's handbook, it's purely flavor as written, and relatively cheap. One element that I like about the 5th Edition approach is that they offer the "wretched lifestyle" (presumably sleeping in a ditch and living off gleaning from fields, trapping rats, and picking through trash) at 0 GP per day. Living well though isn't much more expensive functionally (40 GP a week - which is how I calculate the rough time between sessions - my preferred unit of large scale event game time). To make upkeep interesting I'd suggest offering benefits for a high quality lifestyle. Characters who spend their time between adventures on feather beds, and dining well will be healthier (to a point), better rested and in a better mood then though sleeping rough. To this end I have given a -1 HP/HD to characters who choose not to spend anything on upkeep due to stiffness and the cold they will undoubtedly get from eating stolen baked goods and sleeping in a storm drain, and a reroll to those that spend 500 GP between session on the high life. Various benefits exist between these two extremes, but for player who aren't interested I peg the upkeep for living without penalty or benefit fairly low (5GP per session) so as to be inconsequential. I've found that minor (+1 HP even) benefits encourage players to spend on upkeep and even enjoy it, which not only makes fictional sense (sleeping in the gutter with a wallet full of $100 bills is not popular for a lot of reasons), but can even further invest players in the world (they may want to ask where and how they spent 500 GP on food for example). The mechanics described in the 5th Edition Dungeon Masters Guide are the most detailed around spell research and crafting, and the ones for building fortresses/homes are nicely streamlined (large single cost rather then a design process) compared to older edition's. I would also take the investment rules straight from the 5th Edition Dungeon Master's Guide as they make managing a business a quick downtime activity. Crafting magical items is likewise covered in 5th edition, but it seems quite facile and uninteresting - aimed at a high magic setting, where +1 weapons and healing potions are available from every roadside stand. For my sorts of games magic items are found while adventuring, and rarely at that, so I'd have crafting them require specific items taken from foes (certain magical monsters might have skin suitable for magic leather armor for example) or discovered in the mythical underworld - of course 5E is a more arcno-positivist system with more flamboyance then I'm used to so magic may be commonplace. If one wants to use 5E's default sort of magic economy and setting, I'd suggest increasing the cost of preparing magical items if using Treasure = Experience simply because the characters will have more treasure. Likewise, all 5th edition downtime activities seem to assume that character time (days spent at downtime activity) is the primary cost to the character (in gold as well as 5e has a daily upkeep system), while to me this seems like too much book keeping. One might want to adjust direct costs up, breaking activity away from daily cost associated with upkeep (making upkeep separate with it's own cost/benefit) or if using the upkeep system as written in 5E making certain activities only available at a specific level of upkeep (you can't run a business while sleeping in a ditch and you can't make magic items living in a flophouse without private rooms). Spell Research is largely absent from 5th Edition - designing new spells is against the ethos of a system designed partially for organized play and which distrusts GM and player alike to make their own fun, and spell acquisition is automatic. Personally I find acquiring new spells a fun focus for arcane casters - plundering stolen or recovered spellbooks and doing jobs for arcane knowledge make for a good motivation for wizard characters and hooks for adventure. Spell research though should be expensive, and fairly time consuming - want to change fireball into an orb of freezing ice fragments - that requires both time, and money for experiments and a library of arcane texts. Having wizards build up their library can itself be part of a campaign and certainly protecting such a collection can make a character far more likely to value a particular location. A concept that has fallen out of favor in recent editions of D&D, the henchman was a key component to early games - both providing replacement characters for victims of early editions' brutally deadly combat and swelling the party numbers to make them more effective in combat. Henchmen aren't really a feature in 5th edition, but spending money to increase the skill of retainers or maintain specialists such as sages and heralds (to promote the character's reputations) is a solid option as a downtime money sink. If the player wants their henchman to raise in level they will need to pay x2 the amount of XP required to train them - or whatever simialr rule feel right in your setting. A last way to encourage characters to spend their treasure is on items and supplies. This will likley be where the first few levels of wealth go regardless of options offered, as directly increasing one's survivability is justly on the mind of every adventurer. 5E's books offer a lot of potential areas for this - magic items seemingly for sale everywhere, crafting of more powerful items and their purchase. This may make sense for your setting, but remember that with Gold for Experience you'll be giving away more treasure then the standard WotC adventure intends, and it may be worthwhile to adjust treasure accordingly or to remove the easy purchase of magical items entirely. Beyond useful equipment there are other areas to encourage the expenditure of character wealth. Clothes, lifestyle and offices may appeal to some players who want their character to be recognized as powerful and important. I'd recommend that patents of nobility, knighthood and guild titles be available at somewhat absurd cost in more civilized settings. While none of these titles bring any wealth or power with them they might be prerequisite for moving in certain parts of society - nobility may not talk to anyone without rank, and cabals of powerful sorcerers might not be willing to discuss arcane matters with mere dabblers who don't properly contribute to their library fund or have the right mass of titles. For characters who simply wish to pass as important without title, the outward trappings of wealth will still be necessary to avoid scrutiny and violence in higher society. A 100 GP might by the clothing of a prosperous trader or sea captain, but to pass as a second child of a noble might cost 1,000 GP while pretending to be prince from a far away land could run 5,000 GP or more in finery. Such wealth based limitations can act as portal to new sets of hooks and adventures - the wealthy and powerful have concerns that they may not wish paupers to know of, and which they ay only seek established explorers, successful captains and true sorcerers to solve. These sorts of hurdles can also act as prerequisites for moving towards a domain game - the powers of order may look fearfully upon a vagabond, suddenly rich in tomb gold, establishing a bandit army, while it seems entirely reasonable, even a public service if a local gentleman wants to recruit and train a militia or free company. One of the frequently voiced concerns about using wealth as the sole metric of character advancement is that it will drive players to become amoral and anti-social. A parade of horribles is often deployed to illustrate this, with the supposedly good adventurers transforming into a bloodthirsty scourge that finds it easier to murder the townsfolk they should be protecting then to loot their hovels and gain experience. I believe this critique goes back to the 1980's and the 'satanic panic' about tabletop games, where the lack of rigidly enforced (often Christian) morality in Dungeons & Dragons was seen as an explicit endorsement of evil. To me this appears to be false both based on reading older rule sets (D&D had plenty of devote Christian authors in its formative years and from the earliest editions encodes very strict concepts of good and evil) and false as a practical matter based on my play experience. This isn't to say that some players want to play evil characters and commit evil acts, pushing the idea of 'moral play' - that is playing with and examining the moral quandaries that tabletop games are good at creating - to one grim extreme, but using Gold for Experience is no more a way to encourage this then providing XP for killing foes. That players, and GM, might want to tell a story about brutal anti-heroes, banditry or even tyrannical villains is of course an option - and one that has the potential to be interesting if the players all want to go down that path and the GM is prepared to think about the effects of playing anti-social marauders in a fantasy world. However, most of the "Murder-Hobo" stories I have heard seem to be complaints about something entirely different. Often players become frustrated with overly structured campaigns, where the story feels pre-scripted - and they express this frustration by actively trying to break or 'derail' the campaign, seeking perverse situations where they've killed the NPCs they were supposed to save, burned down the town they were to protect, sold off the magic object that might offer hope for saving the world and tried to ally with the evil bandits they were supposed to kill. The GM is supposed to squirm and flail as the carefully constructed script falls apart. Murderhobos are rarely simply the psychotic dreams of deeply anti-social players, they are an expression of disdain for a GM style that place the narrative above player choice and robs the players of self-expression. The best way to avoid them (or at least make the act of character evil interesting) is to have a game world that has consequences and respects player decisions. Characters devoted to larceny and violence won't be getting commissions as royal explorer of lost tomb, and if they are bad enough they may get a reputation where towns close their gates to them, and bounty hunters or arcane sendings try to cash in to killing or capturing them. Of course changing your campaign from "How can our heroes stop the dragon invasion!" to "How can or bandit gang survive in the woods while dragons invade" may break a plot - but it might also be a lot of fun. Murderhobos aren't a problem unless there's a prescribed end point to your campaign and a set of scenes that the GM is willing to force to get there. Using Treasure for Experience can help break free of this scene based approach to play, because it creates an immediately understandable metric for advancement (XP for Killing does as well - but allows less options for how to advance) that is free of a pre-determined plot. Great post. Maybe you can help me with my central problem of GP=XP. I do not understand why it works within the game fiction. Two fighters enter a dungeon, battle 20 goblins and suffer through a couple of traps. One returns with 1000 GP and the other has 500 GP. Why does one fighter "experience" twice as much as the other? Well first it's not something that makes sense in the game fiction - it's not simulationist - experience levels (really most of D&D) are highly gamified with an eye to providing a certain type of play experience. If you're talking about two fighters in the same group entering a dungeon and grabbing different amounts of loot I'd say you tally up the loot of the entire party and divide it by the number of party members when they return to town - at least that's the way I've always done it/seen it done. Alternatively let the players decide how to distribute treasure and XP (I think this was the original Gygax way), but it's not really a question of which party member can grab the most stuff first (unless you really like PVP). If you mean on two different expeditions why do does the recovery of different amounts of wealth equal different experience - I don't think there's a fictional definition beyond the idea that treasure recovery is a generalized and clear metric for level of success in the adventure and the more you recover the better your characters were at the adventure. This then becomes an adventure design issue, but it's still an abstraction. Right. I've used GP=XP before and always tallied the total loot gain, then divided. I like the elegance of GP=XP, I like what it does, I like the play it encourages... but without a "why" I just can't embrace it whole heartedly. Its just too big an issue for me to accept as an abstraction without pulling me out of the game. I think I have too dang much narrativism in me. Do Hit Points, AC and HD = attack bonus all cause similar troubles? @StevenWarble If you run any systen with noncombat skills that improve with level - or even if you use secondary skills from 1e - the idea that experience comes almost exclusively from combat even if it improves you noncombat skills is also an abstraction. GP=XP rewards players for achieving goals, regardless of the method chosen to achieve that goal. You can use a different method if the goals are different. In a sense, you aren't getting XPs for cash. You are getting XPs for finding and extractimg it, and in the case of unusual or bulky items, safely transporting and finding a buyer for it. Which can be an adventure in itself. I remember one of my players once was not too careful in trying to find a buyer for some jewelry, and ended up attracting the attention of the cult he had taken it from. If GP can be spent on training or research, certainly I can see more gold offering more XP. This could become a problem if players try to game the system and level up by training all the time - hence only gold from treasure earned in adventures can be converted to XP. Do you have the Violence, Debauchery, Lust tables uploaded anywhere? Yes, here they are - they are flavored for my HMS Apollyon setting and partially based off of the classic J. Reints table. I agree that these rules don't encourage murderhobos, but I've definitely encountered players who aren't so much rebelling against a railroad as they want to insert the same antisocial, vaguely troubling power fantasies into whatever they play. Sure there are always those dudes (and I mean dudes) - but I think that treating player choice as choice and having the world respond works there as well - being a super murderface is far less fun when it means living in the woods, watching your armor rust pursued by bounty hunters. It could be interesting. Trying to look past my baggage without forgetting it, it seems like a party assumptions thing. Getting run into the woods by bounty hunter is less fun if it was someone else's foul, so either you're dealing with a split party or a tertiary cost some players struggle to navigate. Or a great deal of finesse is required of the DM. A) Did I provide good descriptions so the results of an action and the risks involved could be fairly known? B) Did the risks/rewards and actions of the world/npcs follow logically from player action and choice? For me the point of moral play is that consequences exist and are organic. Also I don't think the sort of personality driven murderhoboism you're discussing is an artifact of XP method. Awesome stuff! Carousing is a cool idea for "chaotics", I think, not so much for clerics and paladins - who should probably give to church or charity to get XP. Just wrote a brief post about this idea, inspired by yours. This was suggested in the original 1977 Dragon piece. Carousing is of course an optional risk for XP thing players can decide to do or not. One could conceivably write a table for doing good works as well - quite easily even - filled with consequences like being marked by demons a target for temptation, obtaining a blessing or catching lung rot from kissing the heads of too many diseased paupers in benediction. Um...why bother? Why bother with all this work to transform the 5E game when older editions are available? Is 5E such a desirable rule set? I know this sounds like snark, but I'm actually curious. I don't think 5E is all that fantastic, and small rule changes that one might prefer (advantage/disadvantage, "death saves," etc.) can easily be bolted on to earlier editions of the game...far easier than over-hauling the foundational base for character development and adventure design considerations in 5E publications. I just don't get it. Really. Please tell me why I should take the time to convert 5E, when I can (easily, cheaply) pick up a copy of B/X, 1st Edition AD&D, or the original White Box books on DriveThruRPG. I'll have my gold for XP development, I'll have my henchmen, my spell research rules, etc. and there won't be any fuss or muss about it. JB - you shouldn't, perhaps I shouldn't (I am very happy with my current hybrid OD&D ruleset) but there's a lot of people who really like 5E and I think some of them may also want to use it in a way that encourages a more classic playstyle. I've realized reading the 5E DMG and 5th edition commentary that a lot of folks playing it don't understand the basic old school play-style and how the rules work with it. This is an attempt to explain not just how XP=GP works but what it works for and how it works as part of a rules complex. I do gold-for-XP in 5e (& great post Gus!) - 5e has a lot of nice features like the Proficiency Bonus, but the biggest advantage of using 5e is that I keep the player-facing rules familiar to the players who turn up with their 5e PHB, while altering the back-room mechanism by which XP is awarded. It changes the campaign tone but in a way that requires zero work from the players. It is not hard, either - personally I just use OSR material and rarely alter the GP listings, while typically reducing 5e monster XP to 1/5. I get you, man. Sorry about my "wet blanket-ism." One of the things I really enjoy about 5e is the fact that it's the first new edition I've played since 2nd that feels easily moddable. In 3, 3.5, and 4, it always felt like everything was so aggressively balanced that introducing even minor alterations was going to be a headache. 5e seems (especially when looking at various statements made by Jeremy Crawford on the subject) to not really be particularly interested in questions of balance or worried about abuse of mechanical proficiency, so it's a serviceable base skeleton on which to hang a few things (in much the same way OD&D is). It may seem arbitrary to those of us who've been playing for 20 years or more, but a lot of people new to the hobby probably find OD&D-flavored 5e significantly less intimidating than 5e-flavored OD&D. Some folks (me) are stuck with friends who refuse to play B/X, 1e, etc. and so the weekly game just is 5e (and thank God for that small blessing, because 5e is a breath of semi-fresh air after Pathfinder). Which is to say, I was already going to do GP=XP when I run 5e, but it's nice to get somebody else's description of what that might mean before I write it all up from scratch. Another way to calculate experience is to generate random hoards according to the rules, and multiply GP received by the experience necessary to level divided by the expected treasure that would be received over the course of that level. The result is the experience received from the treasure which should average out to be correct over time, and mitigates any potential issues with accidentally giving out too much gold or too much experience. You can calculate wealth by level yourself or just google it. If I understand your suggestion, you're talking about varying XP based on treasure actually recovered to increase or decrease it in a way that promotes a specific speed for leveling? This to me sounds like a means of backing into XP by session or XP by adventure. I enjoy the way that with XP=GP one can have sessions that produce a great deal of XP (though luck, design or player ingenuity) and those that produce little. It's a way to reward success and failure rather then maintain a steady reward. As a method of modifying hoard size to fit XP expectations (so one gets to use the enjoyable old treasure generation systems) I can see it working, but personally I just sort of eyeball the treasure amounts and drop them in based on the Gygaxian ecology (e.g. not real ecology) of the location. As I understand it (and I'm just getting my head into 5e now, I haven't played a session yet), one can calculate the average treasure generated by the random generators over the course of a level. You can then find the ratio of XP to expected treasure for that level. Say the PC is 3rd level. The DM knows he needs 1800 XP to get from 3rd level to 4th level. The DM also knows that on average the PC's share of the treasure hoards that will be received between the start of level 3 and achieving level 4 is 140 gp. As long as the PC is 3rd level he will receive 13 XP for each 1 gp he recovers (1800 XP/140 gp = 12.85 XP/1 gp). If he chooses to take greater risks to gain more treasure than threats typical to his level would ordinarily grant, then he can level faster. In theory this is not linked to XP by session or XP by adventure, because the multiplier is dependent on the level of the PC, not the dungeon or monster. If the PC wants to take greater risks to achieve greater rewards, he levels faster. And you don't skew the game by overloading the PCs with wealth before they would ordinarily achieve it. It works really well in 4e because the amount of treasure awarded increases with each level, and can be made to increase with the power of the monsters. This makes it easy for players to choose risk/reward. However, since writing that comment I have noticed that the same treasure is awarded for each level over the course of a tier, so there are not greater rewards until you hit the next tier. In that case, it may be better to use the fraction (experience gained over tier)/(average gold received of tier) instead, but you are still going to have to tweak the system to ensure that the bigger threats within a tier are more likely to have the bigger hoards. So if the 1st level PC needs 6500 XP to get to the next tier (level 5), and would gain 560 gp over that time, while he is level 1-4 you multiply every gp received by 12 (approximately 6500/560). But you also distribute the 560 gp so the weaker threats have less than the stronger threats. And probably convert it to silver pieces so the amounts don't seem so lame. See this seems like a rather excessive amount of calculation for very little benefit. If I am designing a dungeon with 4 lvl one players that I want to get them to lvl 2 (Using 5E that 1200 XP) I just put say 1200 - 2000 GP in there. If they don't find it all I shrug and they can explore other locations or whatever to make up the remainder (same if 8 PCs bumrush the adventure), likewise if they find more treasure I shrug and they have marginally more money and XP - but hey they earned, I certainly hid that extra 800 GP behind a secret door or in a puzzle. I can see where the method you discuss might be useful if I was running a very strict set of scenes where PC level was a near absolute for overcoming an enemy (both because of a steep power curve and/or because combat was being run as sport). None of these are a wrong way to run a game, but as suggested above GP=XP isn't especially useful in a scene based game, because the narrative structure (and character advancement) are already assumed to be part of the GM's job. Location based games don't make that assumption, and have far less need to tailor threats to PC level so the speed of advancement (among other things) is not of much concern. It certainly isn't that much math in my 4e game. When I create an encounter I place treasure as per usual in accordance with the dungeon/monster/encounter level. If a party finds/retrieves the treasure, I apply the multiplier that is appropriate to the party's level in order to determine the experience to award. That is hardly onerous. I do have to look the multiplier up on a chart. But I only have to do that once when they level, because the multiplier stays the same throughout the level. Follow the link in my name, you can see the chart. I’m not sure I’m making myself clear. You propose to assign XP for treasure at a 1:1 ratio. This means that, in your example, by the time the party of four level 1 PCs get to second level they will have 1200 gp, when they should only have around 560. All I do is change the ratio. Using your 5e example, so long as the characters are first level, for each gold piece they recover, they would get 2.1 XPs. So the party levels after they have recovered 572 gp. If I was designing a dungeon with the goal of having the PCs level at the end of it, instead of placing 1200 to 2000 gp in the dungeon as you suggested, I would place 600 to 1000 gp. If it doesn’t matter how quickly the PCs get rich in your game then there is no need to bother with this. However, PC wealth does matter in my game, and I find establishing the ratios to be much less work than trying to drain excess cash by manufacturing things for the PCs to spend their money on, and hoping I am taxing the PCs at the right rate. Ah I can see it working for that, but yeah player wealth is rarely a concern of mine, and I think generally not so serious in a sandbox game - there's always stuff to spend money on. Alternatively you could fiddle with the amount of XP required to level, or prices (I generally change pricing structures). My own way of handling this is pretty simple: 1 xp per gp recovered, and some multiplier (usually 3x) for each gp _spent_. This keeps the party cash poor while letting the DM throw plenty of material treasure into the mix. As long as you don't let them buy magic items easily, you're good to go. I wonder if you have read or it played Traveller as you refer to it as "hard sci fi," which is exactly what it is not...otherwise, interesting and useful article even though I have zero interest in D&D. I've read a little Traveller and played a game or two - I've also played the second game I mention, which is Universe and one of the more complex and messy 80's simualtionist efforts. The point I'm trying to make about Traveller is in its Gm facing rules - Book 3's efforts at naturalism and a coherence not too at odds with contemporary space science that compared with the 16th century 'science' of Spelljammer make very little sense. Spelljammer is interesting in this way, it concocts a universe that is utterly at odds with modern knowledge about space physics and mechanics, but then spends 1/2 the GM book trying to step back into that sort of scientific rationalization rather just running with the enjoyable falsehoods or early modern celestial mechanics. I like xp for money spent on somethinng that makes sense for a character usually training, research, sacrifices, and influnce along with carousing. It keeps the money flowing out of PC coffers and that's always a good thing.